Inside the ESPN Zone that night on 7th Avenue and 42nd St., suds flowed, fists pounded the bar, and people cheered. A candied cigar scent floated in from the few scrappy OTB’rs who vied for a little more upscale ruckus. This last leg of the Triple Crown was packed with guzzlers and first-timers ready to witness history. The Belmont Stakes announcer sounded like he was caught in an oxygen tank trying to breathe, excited from anticipation. The volume seemed louder with every inhale. Glued to the giant screen above the bar, I stood with a beer, and watched a horse I had known nothing about days earlier make it look easy. Inside, my adrenaline was bubbling for this horse to run faster and faster. I imagined a roar from this restless crowd as Smarty Jones crossed the finish line with a victory. I held my breath. “A nail-biter,” I replied shaking my head. “The odds were so in his favor,” the man nodded. “They were,” I agreed shaking my head. In our brief encounter, he mentioned his obsession with jockeys and statistical equestrian jargon. Before long, I’d nicknamed him Lucky Dan, a southerner who’d flown in from Baton Rouge to take a poke at the city and swim in the glory of its neon lights, if only for a race. In a despondent state at the bar he told me that he’d left his wife weeks earlier after her admitted affair. His two young children were home with family. We threw back a shot of whiskey and talked about our marital woes. Then I had to leave to meet a woman. Unsure what watering hole he’d end up in next, he winked and shook my hand. Lucky Dan was a positive chap ready to muster up a night of booze and beautiful women. “Are you with me?” he slurred in a southern twang. “Not tonight, my friend,” I told him. His voice faded as I wandered into the street. I’d hopped onto an LIRR train and rode it from Hicksville, Long Island to Penn Station a few hours earlier to meet Janice, a city woman I’d seen only in a picture and heard briefly on the phone. We’d met online the day before Memorial Day and in-between her sharp wit, and my snappy comebacks, we agreed to meet for dinner the following Saturday. Over the past year, the dating scene for me had been a B-rated romantic comedy-with-a bad-ending. Most of my dozen weeknight one-act escapades were with strange, dense, self-absorbed divorcees, in my opinion, cashing in on a few hours of relentless self-pity. One had even gabbed with me for six months via phone and instant message and had never wanted to meet. She’d gone so far to remark, “I’m not ready yet, but I’m close.” Another woman yakked with me for four weeks without taking a breath. The night before our first date she called and cancelled. “Tom, I’m orthodox and, well, it wouldn’t be right. You knew that going in.” My response to that was, “And you just figured this out now, tonight?” Two minutes later, I deleted Rebecca The Religious from my cell phone. The night before, I’d driven into the city to meet a red-haired personal trainer named Mindy at Café Luxembourg, on 70th and Broadway, who immediately explained that our pheromones were incompatible. “I can’t feel a signal,” she told me. “Wait. Phera what?” I asked. “Scent? I’ve known you five minutes.” I interrupted. It was a Friday night chemistry experiment that ended early with a slab of steak tartar, a handshake, and a soft pat on the back. Deep inside, I knew that this Streisand-like audacious narcissist would again make the archives. I shuffled through sewer lid steam on 7th Avenue and sniffed my way past the salty smell of pretzel carts and mouth-watering hot dog stands. I’d even elbowed my way through the bustling crowd to find the subway stairs at 42nd, but was unsure which train Janice had mentioned would take me to my stop uptown. There was the local 1 and 9, the 2 and 3 express, and an army of people with cameras hanging around their necks on the subway station booth line looking just as confused. A bit light-headed from the beer, I sauntered through the turnstile, hoping my conversation with Janice from a few nights earlier would jar my memory. That’s when I heard the piano. Three steps down, in the center of the concourse a young boy crouched on a stool behind a keyboard. He wore a thin black tie loosened at the neck over a white button down. His red polka dot suspenders were strapped over his shoulders and a pair of wire frames rounded out his appearance. A navy sport jacket was draped over a small director’s chair on the side. A crowd of twenty or so snapped, tapped, and wiggled. “The Entertainer” was spot on. On the ground next to the keyboard was a white plastic bucket filled with dollar bills and coins. In back of him were two stocky men with hats who stood guard while Kid Wonder’s eyes stayed glued to those sticks of ivory. I smiled and thought to myself as my eyes met these strangers, “I love this place.” When he stopped, the diehards beckoned for an encore. Some stayed as he segued into a much slower song. The piece sounded familiar but my attention soon wandered off into the direction of a noisy subway. The heat was so thick on the platform that I found it difficult to breathe. My stomach began to cramp and the jitters set in. In one hour I’d be eating dinner with another online stranger. “How long can I keep doing this?” I thought to myself. I remembered the Larchmont woman from 9 months earlier I’d dubbed Debbie Delayed. Her sense of direction the night we met was somewhat off kilter. She showed up 90 minutes late for our date and insisted that mapquest was “technically” in the wrong. The amusing side note to this disaster was that the restaurant was in Larchmont. Then she double parked in front of the pub, jumped out, and flagged me down on the sidewalk where I’d been yukking it up with the bar crowd to let me know she had made it. I was too blitzed by that point to even care. In my mind, that night was over before it started. I had hoped this wasn’t a repeat. That was when I started to doubt myself. Fifteen months earlier in Bellmore, I’d walked out of a dysfunctional marriage just shy of nine years, leaving a seven-year-old daughter without a Dad for a short time. In between then and now, the many female acquaintances I courted never lasted. My life had been a rollercoaster of demented drama in the midst of getting settled and trying to find my soul mate. “A hundred and third,” he answered. “Right on schedule,” I joked. Just then my daughter, Marlee, came bursting through the hall’s screen door and out onto the sidewalk. I covered the receiver with my left hand. “You can’t, go back inside, now! It’s the girl from the computer last night, remember?” I whispered. “Is that your daughter?” she asked. 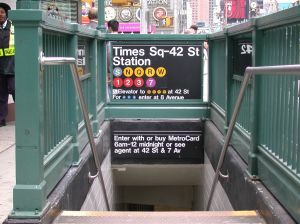 I jumped out of the subway at 103rd and Broadway just as the doors closed behind me. The late afternoon heat had crawled into my royal blue button down and sweat began to trickle down my back. To kill time I popped into the Mexican Deli and browsed, chugged a cold draft at Tap A Keg, swapped one-liners with the hostess at Toast, and then entered Henry’s at the corner of 105th and Broadway. Janice’s first recommendation had been a café called The Heights, seven blocks further. The Heights was a bit too loud, in her opinion, so she called me and asked if we could move our date to a quieter place. “I like that white fence,” I told the hostess as I approached her stand and pointed to the tables outside. “Is that part open?” I asked tilting my head toward the outdoors. It was my third tab in less than two hours. I slid onto a high stool and ordered a draft. Every coaster seemed to have the same pattern, every face looked the same. “Would the night end like this?” I thought as I dug into the small tin of party mix on the mahogany and launched into a daydream. My blurry cell phone clock seconds later said 10:15. I blinked, then blinked again. Debbie Delayed waved from the dimly lit front entrance. I slid off the stool and moved toward the red wood doors out onto the sidewalk. Debbie was gone. The beer in my hand had vanished. When I turned, Henry’s was a parking lot. “Is something the matta?” she asked. To my left was an attractive young woman in a beige blouse with the sleeves turned up. Several inches from her eyes was a magazine she seemed to be reading. I noticed her thin light-brown hair in a bun and crossed legs. She glanced over the page at me and delicately plucked an onion ring from her oversized martini glass. “Nah, I’m good,” I nodded. “You weh starin’ into space,” she said. I smirked, shook my head, and took a sip. I never caught her name but she reminded me of Diane Keaton’s character Theresa Dunn in Looking for Mr. Goodbar, only a bit more subdued. She was a slender gal with little jewelry and flat shoes. Her boyfriend was stationed somewhere overseas and every now and then her buds would thirst for some quality Upper West Side grub, so she told me. “I’m not one for the horses, but I heh’d it was excitin’. Ya hee with someone?” she asked. “Blind date, waiting, for a blind date,” I told her. I thought, “Maybe I should get Theresa’s number in case Janice didn’t work out. But, what if it did, then what? I’d feel guilty. She’d understand, right? We didn’t exchange names so once Janice comes, we’ll bid farewell. But…” She stared and I stared back. The onion rings sat quietly, untouched. A television on the wall above played a ball game with no sound. Laughter erupted from a table somewhere in the place. Moments later, Janice walked in. The hostess sat us toward the rear of the restaurant but off to the side where we spent the first few minutes talking about our online chat. Then the conversation turned another way. I reacted a bit anxiously. After a deep breath and a smile, I noticed that Janice was attractively quiet with thick, curly blonde hair, and a pale complexion. A Long Island native, she’d been living in the city since the early 80’s, right after her one year of post-graduate study at SUNY Albany. Her parents and older sister had moved to Boynton Beach during that period and she opted out of the Florida humidity and stayed north. At 5 foot, she stood just shorter than her Dad, the tallest in her family. She left publishing in ’96 and enrolled at the Swedish Institute to become a licensed massage therapist. Three years later she started her own business and had a lucrative practice massaging the ultra-wealthy on the upper east side. For several hours we exchanged comical dating stories, family tales, humorous lines from old sitcoms. She was well-read and intelligent, graduating number 7 in her high school class of over 700. What did cross my mind several times was the fact that she had never been engaged or married. It was a concern but the night was more important. My daughter, Marlee, was mentioned just briefly. I thought, “If we get serious, how will she handle being with a nine year old every now and then?” Another issue I’d need to consider. But, Janice and I had a connection, a chemistry. There wasn’t a lull in our banter all night. After dinner, we walked and talked. We shuffled down Broadway to 72nd, and across to Central Park West passing Gray’s Papaya and Sambuca’s Restaurant. She wasn’t fazed by my past, just overwhelmed that I’d been through quite a bit. Up to 96th St. and over to Broadway, we hiked talking about her experiences living in Queens, then Manhattan. She walked me past Tom’s Diner, the one used in Seinfeld. I stood there in a daze as she smiled. We stopped at Deluxe, a café at 112th and sat outdoors for some desert. It had been three hours since we’d met in Henry’s. There was a full moon above us and I told her to make a wish. We both closed our eyes and sat in silence for a minute. When we opened them something seemed to be missing. The waiters had started removing the metal fence and the tables surrounding us. We didn’t get up, just chuckled and continued our conversation where we had left off. They left us alone sitting at a table in the middle of a Manhattan sidewalk where nothing else seemed to matter. “I guess this is it,” I said in front of her apartment building near Columbia University. “I guess so,” she answered. I opened the apartment door the other day, bent down, and picked up the New York Times from the brown tiled floor in the hallway. Jan was still sleeping so I placed the paper on the purple velvet chair in the kitchen where she’d see it when she got up. She had read the Times cover to cover almost everyday since I’d known her. It was a ritual. The night before, I’d suggested breakfast at Kitchenette, a small eatery on Amsterdam Avenue near our building. I looked forward to the weekends. Sometimes, my 17 year old daughter Marlee would come in from Long Island and visit, but not today. We’d relax in the morning and go for breakfast, and then celebrate our eight year anniversary in the evening. The Belmont stakes was up for grabs once again and my mental bets were on Animal Kingdom and Stay Thirsty. I’d watch it from the best seats in the house, our studio apartment. We often joke about the day we met and the events leading up to our first encounter. I sometimes imagine a 21-year-old Kid Wonder decked out in a button down shirt rolled at the wrists, tie, and vest, in a dimly lit 3rd Avenue bar. He’s behind a Hammond upright wearing a Fedora. A second one is upside down on the wood in front of him filled with bills and change. The smell of loaded potato skins fresh from the oven lingers throughout. Five television screens throughout the place play some race, any race. The Kid is stuffed in the back playing Maple Leaf Rag while the others pound their fists into the bar, shout, and yell at the bartender, “Another round down here!” Theresa and Lucky Dan are at a table off to the side. Their lips are moving but I can never hear them. They seem to be lost in their own agenda. It’s Saturday in mid-town and the stakes of ending up together are fairly high. That June night back in ’04, Smarty Jones, the 2 to 1 favorite, lost his bid for the Triple Crown in one of the closest races I’d ever seen. The chance that Janice and I would continue to date, and eventually move in together was quite a long shot. I couldn’t have predicted a better finish. I love this “meeting the love of your life” story so much. Jan is a gem! Also, an awesome title that ties in perfectly at the end with the racing theme.